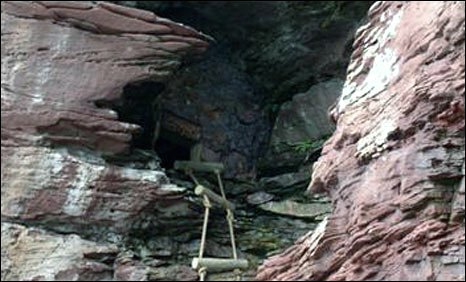 A "house" in a cliff side has been discovered by lifeboat crews responding to an emergency call in Angus. The Arbroath RNLI team was investigating reports of cries for help coming from local caves on Tuesday. After scouring the area they spotted a rope ladder which led into a cave house built into the rocks. The dwelling, about half way up the 120ft cliffs, contained a floor, painted walls, seating, tea lights and several beer cans. No-one was home at the time. Its exact location has been kept secret, to prevent curious members of the public putting themselves in danger trying to find it. Allan Russell, from the Arbroath RNLI lifeboat, said: "This is certainly the most unusual thing I have come across during my 10 years as a lifeboatman. "It's been well made - it's been cemented into the cliffs, sealed round the entrance hatch, the rope ladder's tied down with eye-bolts, so it's been professionally done. "There are also the beer cans - they're still quite fresh. There was also a blanket - like an old carpet wrapped up - and there were a couple of chains bolted into the walls. "We are all wondering who has gone to such time and effort to build this." Ross Greenhill from the Maritime and Coastguard Agency said there were several reasons for its existence. "Somebody could be using it as a fishing den - we do get quite a lot of night fishing so it's possible that someone's decided to make it a bit more comfy," he said. "It could be youngsters using it as a bit of a hidey, or potentially something a bit more sinister but we'd rather hope not. "It's certainly not easy to find, it's difficult to see, so if someone was wanting a bit of privacy it's the ideal location." Mr Greenhill urged people not to go looking for the cave as they would be risking their safety.